Vision for the walk-up renewal proposal by HASSELL. A recent study by HASSELL considers the possibilities of urban renewal for higher density residential areas in Sydney, David Tickle presents the resulting proposal for new neighbourhoods. Housing is the most important building block of any city. For most of us, a home is our most fundamental physical need, our biggest financial investment and the place that encapsulates our sense of self. Good housing is critical to the liveability of a city which relates directly to the ability to attract and retain global talent – a key determinant in a city’s prosperity. HASSELL has been undertaking a study of housing in three global cities- Sydney, Shanghai and London – as part of our Urban Futures initiative, a program of speculative, city-focused research and design projects. All cities are grappling with a range of challenges around housing, such as affordability and supply (often, but not always, related), delivering density without compromising quality, and social and ecological sustainability. HASSELL’s study recognised these shared challenges, but also sought to identify how each city is making progress on addressing them – and in turn, how each can learn from the successes of the others. 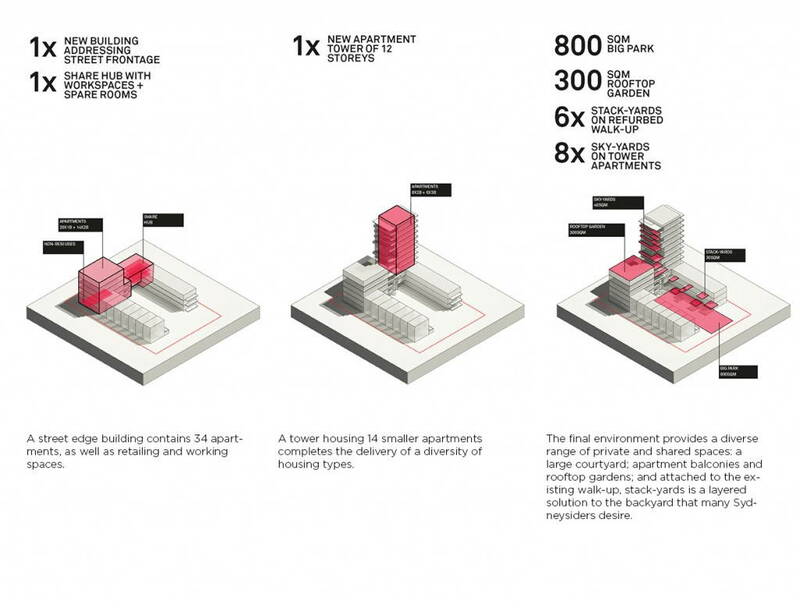 A representative housing typology was selected for each city: the walk-up apartment in Sydney, the row house in London and the xincun (worker’s village) in Shanghai. The selected housing model needed to have the potential to undergo transformation for better social, economic, environmental and urban outcomes. These speculations test the application of the successful elements of one city to the others: for instance, how could Sydney adopt the density of London, perhaps the delivery speed of Shanghai, without unwinding the significant gains made under State Environmental Planning Policy No – 65 Design Quality of Residential Apartment Development (SEPP 65) and other design quality mechanisms? The walk-up apartment model first appeared in Sydney during the early 20th century – population growth was rapid and it had become obvious that the city needed to intensify rather than simply expand. Under the later Regulation of Flats Act, single lots could be redeveloped to multi-unit buildings, with blunt height (three or four storeys) and setback (front, back and sides) controls applied to these sites. While delivering a boost in density, the walk-up also delivered multiple issues – limited diversity, a lack of interest in the street, an acceptance of car-dominated travel, and provision of poor open space, both private and shared. The walk-up is often cited as largely responsible for the negative perception of higher density living in Sydney. A true transformation of this housing typology means moving beyond the lot-by-lot approach that first created the walk-up typology: it requires renewal at the street, neighbourhood and suburb-wide scale. 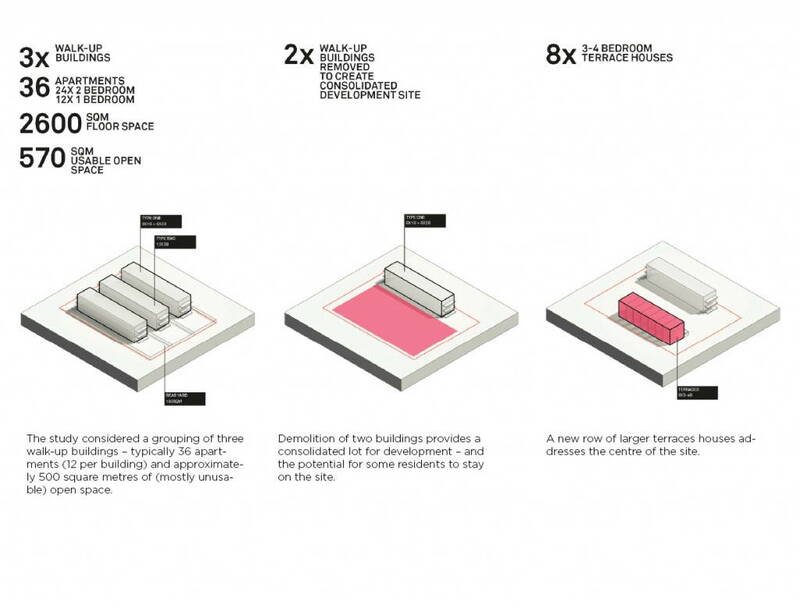 This approach to renewal (see diagram below) has the potential to deliver more of everything – double the dwellings, double the floor space, double the open space – as well as diversification of uses beyond residential. Within the Auburn town centre, a typical walk-up suburb, there are up to 70 of these walk-up apartment clusters, yielding the potential for 5000 new apartments (an increase of 2380) as well as the delivery of more than 70,000 square metres of green space – the equivalent of twice the amount of green space than the town centre’s Auburn Park. Applied at the same scale to just 10 other locations, 10% of Sydney’s projected housing needs could be met. This would provide a significant boost to housing being delivered in areas already identified in state and local government plans. Across the three cities of Sydney, London and Shanghai, the HASSELL study demonstrates significant potential – up to 1,000,000 new homes, but importantly, up to 100 much improved neighbourhoods. Thinking at the scale of the neighbourhood, rather than the individual home, yields the greatest impact in creating more sustainable, better connected, higher quality housing. Now decades old, many of Sydney’s walk-ups are reaching the end of their useful lives. Their radical transformation may not only be desirable, but – in helping to contain Sydney’s sprawl and spiralling unaffordability – desperately needed.